Preventive medicine is defined as the part of medicine engaged with preventing disease rather than curing it. From the very beginning, Oriental medicine has had a bias toward keeping patients healthy rather than treating disease. Years before an affliction can be detected with MRI�s and lab tests, biochemical and energetic imbalances exist in the body. These imbalances may present as pain, sleep disturbances, mood changes, abnormal digestion, headaches, and menstrual irregularities. Through the process of evaluating subtle physical signs as well as the emotional condition of a person, practitioners of acupuncture and Oriental medicine can detect health problems in their earliest stages, before a person becomes gravely ill.
Once the nature of an imbalance has been determined, a customized program can be created for you. Your treatment may include acupuncture, herbal therapy and tui na, as well as food, exercise and lifestyle suggestions. It is recorded that the first emperor of China, Qin Shi Huang (259 BC-210 BC), who is credited for the Great Wall and the Terracotta Warriors and Horses, established a health care system in which physicians could only accept payment or donations from patrons who were kept healthy and, vice versa, were not paid when someone fell ill. This system remained in effect for centuries. The people of each village would provide shelter, food, clothing and money to the local physician for maintaining the health of the community. Physicians risked punishment or execution when someone died and were required to wear a mark for their failure. You could essentially see a physician�s track record before you chose to use their services! 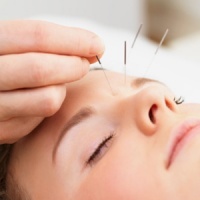 Seasonal acupuncture treatments just four times a year serve to tonify the inner organ systems and correct minor annoyances before they become serious problems. Call an acupuncturist in your area to see how Oriental medicine can help you stay healthy! One of the many ways that walking can promote health and wellness is by putting gentle pressure on Yongquan (Bubbling Spring), an acupuncture point on the sole of the foot. In Oriental health theory, this is the starting point of the Kidney meridian and stimulation of this energizing point can promote clarity of the mind and stabilize emotions. Yongquan is located in the depression on the sole of the foot at the junction of the anterior third and the posterior two thirds of the sole. The acupuncture point, Yongquan, has been found to benefit high blood pressure, stress, insomnia, headaches, sexual potency, and kidney function. To stimulate Yongquan while walking, let your heel tap the ground gently, then feel your weight transfer fully to the ball and toes of your foot. Focus on breathing into your lower abdomen, keep your shoulders relaxed and allow your arms to swing freely. Yongquan tapping and ball rolling: Use your fists to strike your Yongquan about 100 times on each foot. Or, gently roll a tennis ball under your foot while relaxing on the couch.